Since version 1.400 it is possible to directly export a dense point cloud or a mesh to Sketchfab. You can still obviously export a PLY/OBJ file and upload it manually to sketchfab, or you can export your reconstruction directly with a few clicks. From the “Export menu” (1) select “Export Mesh” (2) – the “Mesh Export” window (3) will appear. Pick the extracted mesh you wish to upload to Sketchfab and from the “Export Format” dropdown menu (4) select “Upload to Sketchfab” (4). Edit the export settings to match your desired export settings and when you are ready to proceed simply click the “Export” Button (5). The sketchfab upload settings window will appear. From this window, all you have to do is fill in the API key textbox with your sketchfab API key (a 32 characters string that you can find when logged in sktechfab.com in your My Settings -> Password & API page). You can optionally fill in the model name, description and tags for the model you wish to upload. 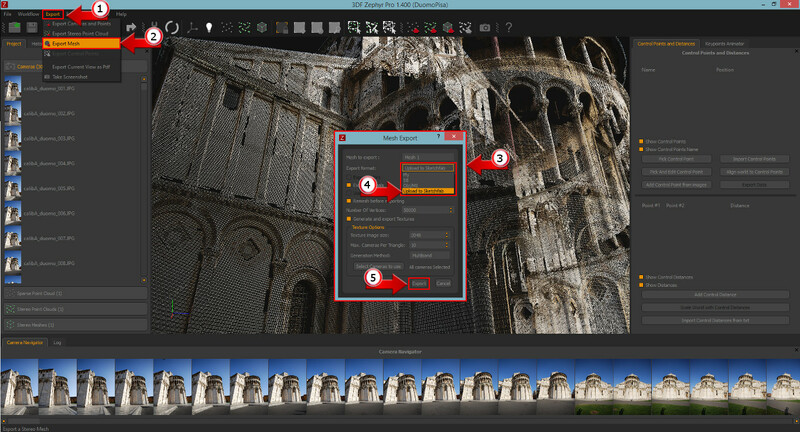 A similar workflow is available when selecting “Export Stereo Point Cloud” from the “Export menu” (1). If you wish your model to be shown in our showcase section, feel free to touch base with us on our forum or via email! Please refer to the following paragraph for common problems. Q: The model is shown correctly inside Zephyr, but the texture is “pixelated” on the sketchfab viewer. What happened ? A: Georeferenced images use 3D coordinates that are not fully compatible with the Sketchfab viewer, which may render you 3D model as “pixelated” when viewed on sketchfab. Either use the in-zephyr upload option, as explained above, or make sure to select “local rendering reference system” when exporting your mesh. Q: My model is too big! Why can’t I upload it on sketchfab ? Sketchfab is free up to certain thresholds. Please make sure your account has the proper privileges to upload certain files. You can refer to Sketchfab’s website for more information.